The best workout I have had in about 3 months was today. I go to the gym 6 times a week and have been in a slump this whole time. Usually, after work, at about 5:30 I head straight to the gym after taking some jacked 3d or some other pre-workout drink. But my workouts were getting to be harder and harder to get through. I thought I was becoming tolerant to the creatine and nitric oxide in my pre workout. I was wrong, my body was tired from all the days at work and I needed some sleep! What made today the best workout in 3 months was the two hour nap I took right when I got home from work. I had every intention of going to the gym right then so I took some protein and decided to wait for it to get in my system before working out. My fatigue took over and I fell asleep for two hours! When I woke up I felt a little groggy and went to get some laundry and other things done to wake up. Then I took my Jacked 3d and headed to the gym. I instantly felt great! My muscles and mind were rested and I had a little nutrition in me from the protein before my nap. The pre-workout drink kicked in right away and I went and did chest, arms and abs. I was lifting at weight I haven’t been able to touch for many months and my muscles were teaming with blood flow. My arms and chest felt like they were going to rip out of my skin! It was the best pump ever! I was bouncing from workout to workout without rest in between because of the renewed energy I had. My Monday workout was as good and better than my usual Saturday workout. Saturday’s are usually good because I am rested. 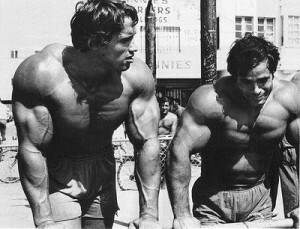 I got this quote and picture of Arnold (on right) about muscle pump off of josephpohan.com. My enthusiasm caught the attention of many other gym goers and the casual gym conversation was back. I felt so alive! When the big guys in the gym ask you to spot them you know you are doing something right. This entry was posted in Bodybuilding, Fitness, Workout Routine and tagged best workout, fatigue, jacked 3d, muscle pump, pre-workout, protein by Russell Jensen. Bookmark the permalink.